Introduction: Neural tube defects are one of the most common congenital birth defects resulting in a significant number of physical, mental and social disabilities in the earlier years of life. Amongst the central nervous system anomalies which are reported in 31% of newborns with anomalies, myelomeningocele (MMC) is the most common of the central nervous system defects with upto 71% occurrence. Objective: To determine frequency of post-operative complications in the repair of myelomeningocele. Material and Method: This study was a Descriptive case series conducted at Pakistan Institute of Medical sciences (PIMS) Islamabad from March to September 2016. Consecutive (non-probability) sampling technique was used.Total of 156 patients were included in the study who presented in neurosurgical department of PIMS, Islamabad suffering from meningomyelocele. Mean Age of presentation of patients was 58.58 days ± 26.01 Std. deviation. 88 patients (56.4%) were males and 68 (43.6%) were females. 79 patients had size of defect < 5 cm, 68 patients had size of defect ranging from 5-10 cm and 9 patients had defect size > 10 cm in size. 21 patients (13.5%) wound showed signs of surgical site infection while 135 patients (86.5%) wounds healed satisfactorily. 37 patients (23.7%) had CSF leakage while 119 patients (76.3%) recovered completely. Post-operative pyrexia was noted in 141 patients (90.4%) while 15 patients (9.6%) remained afebrile. Post-operative Hydrocephalus was seen in 35 patients (22.4%) as compared to 121 patients (77.6%) with no hydrocephalus post operatively. Conclusion: The study concluded that early diagnosis and prompt management is key to recovery of child. Early operation without subsequent complications is the backbone of treatment. 2. Khattak ST, Khan M, Naheed T. Prevalence and management of anencephaly at Saidu Teaching Hospital, Swat. J Ayub Med. Coll. Abbottabad, 2010; 22: 61-3. 3. Sibinski M, Synder M, Higgs ZC. Quality of life and functional disability in skeletally mature patients with myelomeningocele-related spinal deformity. J Pediatr. Orthop. B. 2013; 22: 106-9. 4. Roach JW, Short BF, Saltzman HM. Adult consequences of spina bifida: a cohort study. Clin. Orthop. Relat. Res. 2011; 469: 1246-52. 5. Pruitt LJ. Living with spina bifida: a historical perspective. Paediatrics, 2012; 130: 181-3. 6. Rathod KJ, Mahajan JK, Khan RA. Quality of life of very young spina bifida patients after initial surgical treatment. Childs Nerv. Syst. 2012; 28: 883-7. 7. Raza MZ, Sheikh A, Ahmed SS. Risk factors associated with birth defects at a tertiary care centre in Pakistan. Itali J Pediatr. 2012; 38: 68. 8. Gilani S, Kazmi NHS, Najeeb S. Frequencies of congenital anomalies among newborns admitted in nursery of Ayub Teaching Hospital Abbottabad, Pakistan. J Ayub Med Coll Abbottabad, 2011; 23: 114-6. 9. Raza M, Habib S. Frequency of prenatal central nervous system anomalies detected by ultrasound in a tertiary care hospital. Pak J Med Res. 2013; 52: 19-21. 10. Khan MY, Khan K, Ahmed M. Short term outcome of surgical management of patients. 11. McLone DG, Dias MS. Complications of myelomeningocele closure. Pediatr. Neurosurg. 1991-1992; 17: 267-73. 12. Mirzai H, Erşahin Y, Mutluer S, Kayahan A. Outcome of patients with meningomyelocele: the Ege University experience. Childs Nerv. Syst. 1998; 14: 120-3. 13. Sin AH, Rashidi M, Caldito G, Nanda A. Surgical treatment of myelomeningocele: year 2000 hospitalization, outcome, and cost analysis in the US. Childs Nerv. Syst. 2007; 23: 1125 7. 14. Kshettry VR, Kelly ML, Rosenbaum BP, Seicean A, Hwang L, Weil RJ. Myelomeningocele: surgical trends and predictors of outcome in the United States, 1988-2010. J Neurosurg. Pediatr. 2014; 13: 666-78. 15. Demir N, Peker E, Gülşen İ, Ağengin K, Tuncer O. Factors affecting infection development after meningomyelocele repair in newborns and the efficacy of antibiotic prophylaxis. Childs Nerv. Syst. 2015; 31: 1355-9. 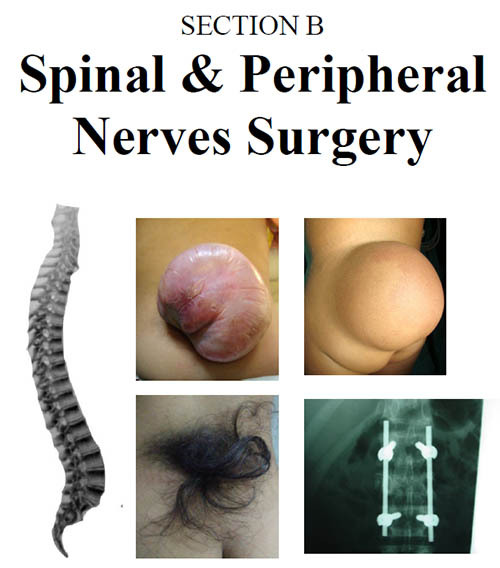 16 Pang D. Surgical complications of open spinal dysraphism. Neurosurg. Clin. N. Am. 1995; 6: 243-57.